PARCO is planning and developing new properties in PARCO, ZERO GATE, and new store formats. With the opening of these properties, PARCO will enhance its business presence and provide even greater value to stakeholders. 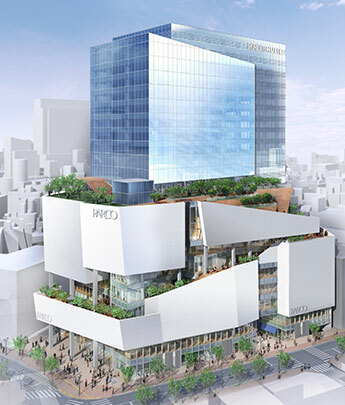 Shibuya PARCO has been temporarily closed for the construction of a new mixed-use development that will include a regenerated Shibuya PARCO store. The construction of the New Shibuya PARCO will help drive the evolution of PARCO Group business, expanding touch points with new companies, enhancing tenant services, strengthening content that connects to the concept of Shibuya as an international “Entertainment City”, and boosting our presence on the global stage. PARCO aims to create a next-generation commercial space that gathers new ideas and creations that haven’t previously found expression. PARCO plans to open a new store in the North Building of Daimaru Shinsaibashi in the Shinsaibashi district of Osaka, an area where there are currently no PARCO stores. The new opening will mark the second collaboration between PARCO and the J. Front Retailing Group, following the joint project to open PARCO_ya in Ueno Frontier Tower. The opening of this new location represents a key component of PARCO’s Medium-term Business Plan. As preparations for the launch continue, we hope the new store will fulfill the needs and expectations of local consumers and capture the essence of Shinsaibashi, an iconic commercial district in the Kansai region. We are renting a building to be newly constructed in front of JR Kawasaki Station and preparing for the opening of the early autumn 2019 as "Kawasaki ZERO GATE (provisional name)". A new shopping complex is planned for development in Urasoe, Okinawa Prefecture. Joint venture SAN-A PARCO, Inc. will oversee planning and operation of the new facility. PARCO and SAN-A aim to create an attractive new shopping complex by fully exercising their respective strengths; namely the management resources and integrity cultivated by SAN-A through its retailing and restaurant operations in Okinawa, and PARCO’s expertise in operating urban shopping centers.